Perhaps I need to revisit Michael Zavros. Between seeing his show 'Calling in the Fox' at GrantPirrie I have undergone such a change in feeling about the work I almost need to check whether I really saw the works that left me so happily surprised the first time, so different on reflection. Zavros is a conceptualist in a hyper-realist's body. His signature works are oversized fashion portraits with faces erased or modern centaurs, monochrome suited men sprouting from the bodies of horses. Their scale and black and white photographic detail remind one of Robert Longo's 'Men In Cities' but with a further twist of a post-modern raised eyebrow. There is a slick shiny photoshop quality to his work, quite consciously so I imagine, as he works in the gaps between fashion imagery and male narcissism. The first thing that strikes one about this show is the sheer range of work. Not just of media or subject, his is a composed show, where size really does matter. 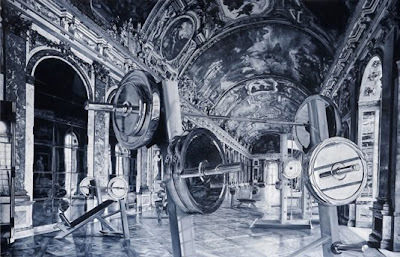 Thus in one turn we can move between microscopically detailed miniature copy of what looks like an eighteenth century portrait to a massive, wall-wide, fantasia of Versaille's Hall of Mirrors inhabited by pristeen weight lifting equipment. 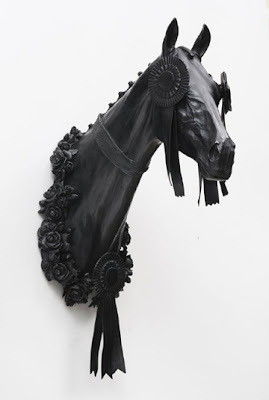 Along side these pieces are a series of highly accomplished, mainly equestrian, bronzes. Shown together these works appear to be a meditation on the visual image and status, seen in isolation they are little more than pastiche. 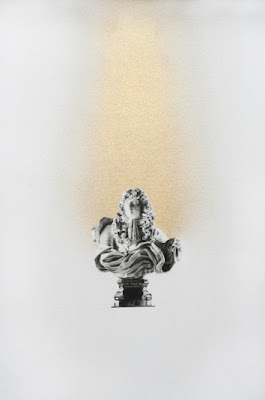 It's clear from seeing a little of Zavros's work that he is a seriously accomplished draughtsman, his facility in paint and charcoal is extraordinary, and if he's responsible first hand for the bronzes he is a talented classical sculptor. This almost photographic ability is essential as he records surface so precisely. 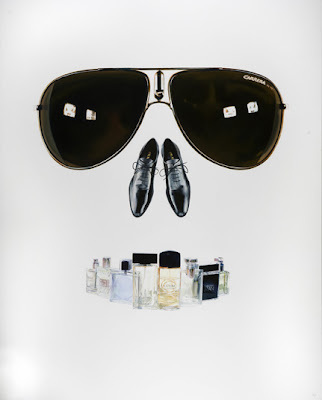 So in his giant still lives of perfume bottles, shoes and sunglasses the proximity to the original advertising shoots together with the disorientation of these objects isolated on blank white canvas gives them a status of something like a fetish. They seem entranced by the crystalline beauty of the fashion shoot and at once disgusted by it. A second strain of work is the dislocated rococo interior or stately folly. 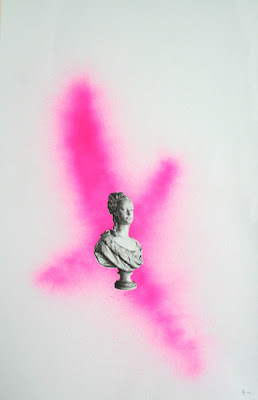 Again Zavros renders marble busts or the perfect order of an aristocratic garden in charcoal, across these hommages to a Sun King are sprayed (or so it appears) tag-like swathes of day-glo pink or green. In these cases one suspects it means quite a lot but it's hard to say just what. It might be the case that Zavros is concerned with the innate role of art in establishing a particularly male expression of status. Louis XIV's mythologizing and and Prada glossies are presented in parallel and visually similar ways. 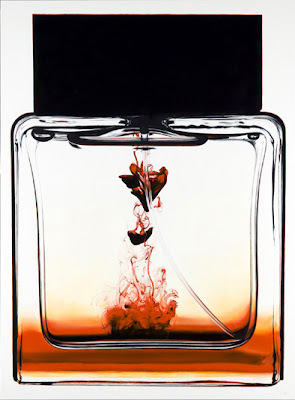 The seduction of the image is supposed to be jarred by its context, the bloodlike suspension in a giant perfume bottle or the rude spray across a manicured estate. But I can't help but feel that so much of that response comes from the fact that it's such familiar and well trod territory rather than form any innate quality in the work or the idea. It's as though we're programmed to respond to such beautifully rendered works when we see them in a contemporary art gallery (particularly of luxury brands or their historical equivalent) in an ironic way, that they can only mean that there's a worm hidden in that gorgeously shiny apple. Maybe it's that feeling that as capable as Zavros is he's dealing in clichés, albeit fashionably ironic ones that left me so queasy so soon.